- There's no essential plot or exposition in this episode that renders it unskippable, but it's definitely one of the better stories of the series. 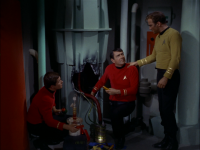 - This episode firmly establishes that Vulcan mind melds can be performed without touch but are more successful with touch, a fact previously only implied by a couple prior episodes. 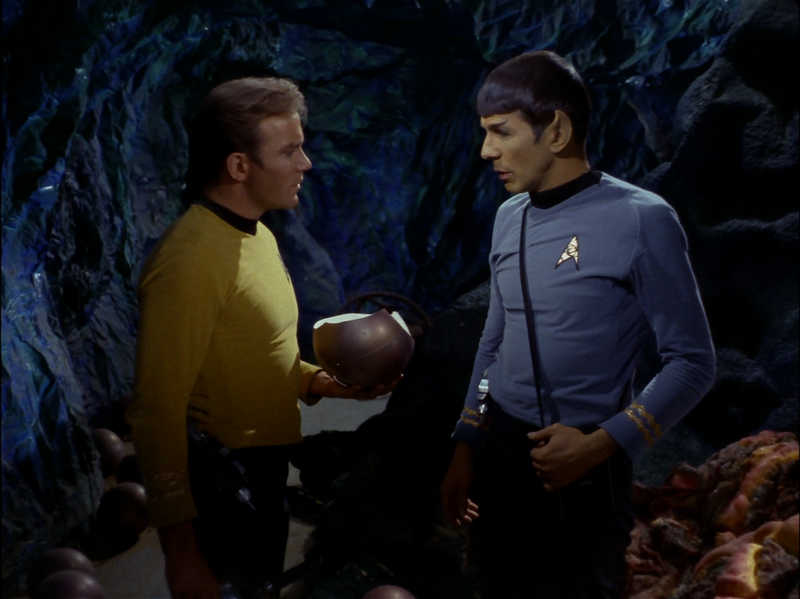 - Spock proposing that the monster might be silicon-based and McCoy's reaction. 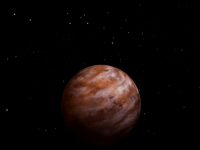 - The hilarious looking silicon-based life form. - Spock hypothesizing that the silicon-based life form may be the last of its kind and that they should protect it at all costs. - Spock: "The creature is in your area. Take a life form reading." 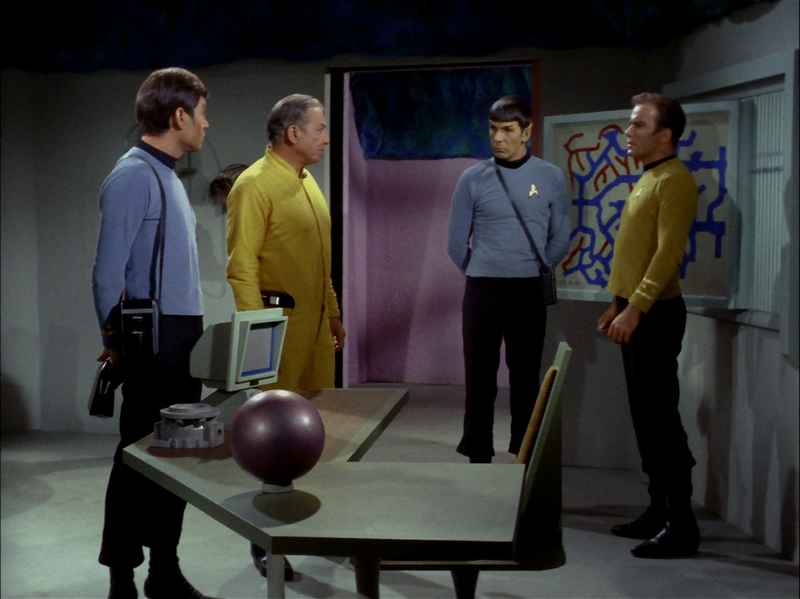 Kirk: "That's not necessary Mr. Spock. I know exactly where the creature is." Spock: "Where, captain?" 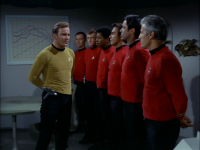 Kirk: "Ten feet away from me." 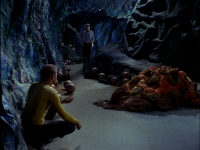 - Kirk hesitating to kill the creature. - Spock's mind meld with the silicon-based life form. - McCoy's reaction to seeing Spock mind melding with the silicon-based life form. - McCoy: "By golly Jim, I'm beginning to think I can cure a rainy day!" The Devil in the Dark is a terrific story with excellent pacing, especially at the beginning. I'm not typically a fan of the horror movie aesthetic, but this episode rises well above that by delivering a narrative with a compelling moral dilemma enhanced by well crafted sci-fi texture. Stories about how human resource extraction often comes at the expense of indigenous life are nothing new, but the alien characteristics of the lasagna monster--er, I mean silicon-based life form are what make this story particularly compelling. Scientists have long suspected that because silicon and carbon share many chemical properties that it may be possible for a hypothetical type of biochemistry to exist based on silicon instead of carbon. 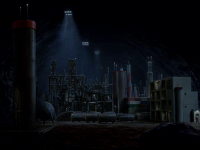 While I have my doubts that the lasagna monster depicted in this episode is a very realistic extrapolation of what silicon-based life might look like, the episode grapples with the idea in a reasonably intelligent way for the most part, even if it may leave you slightly hungry for lasagna after you're done watching it. 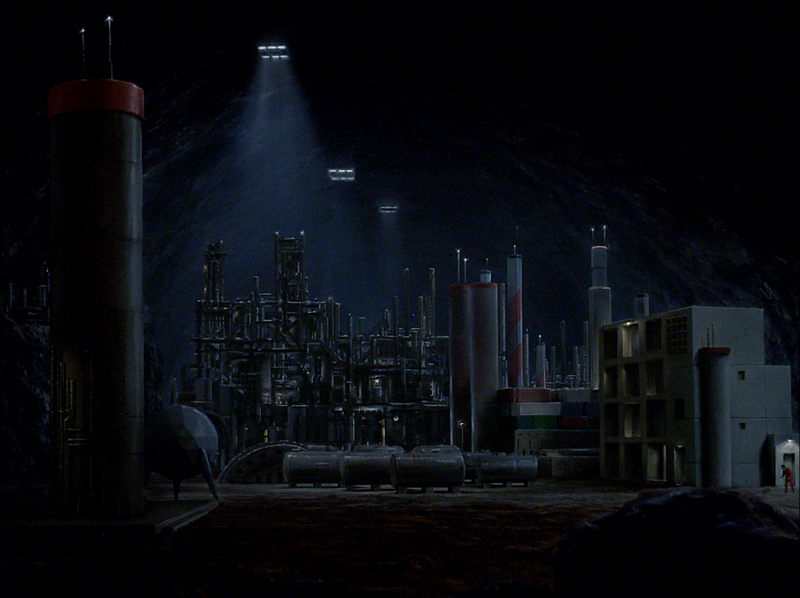 One of the best details of the episode is the plot's constant struggle to reconcile the desire to protect the miners with the concurrent desire to preserve the life of the creature. 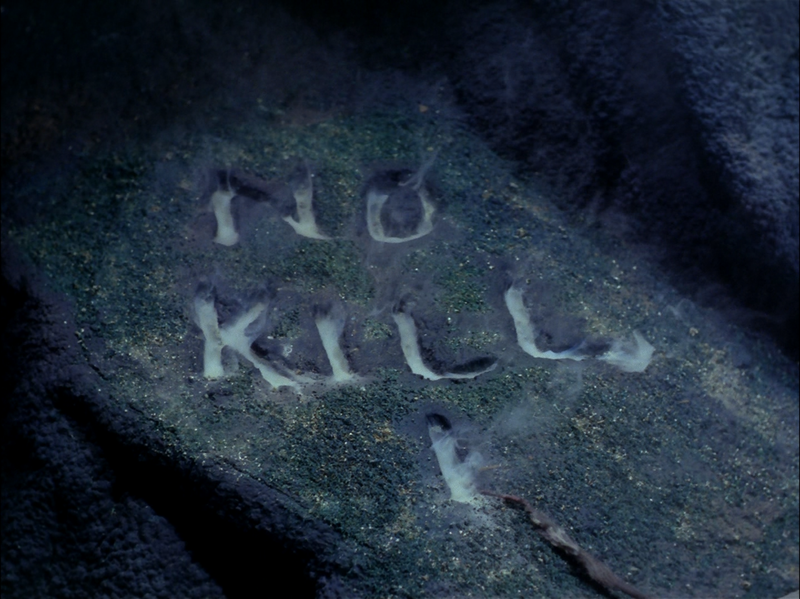 At first Spock questions the need to kill the creature only to be lectured by Kirk that a murderous rampaging monster cannot be permitted to live. But later on in the story their positions interestingly reverse. When Kirk personally confronted the creature, he realized that in its wounded state it had been rendered far less aggressive and Kirk started to ponder a means of rendering it harmless without killing it. 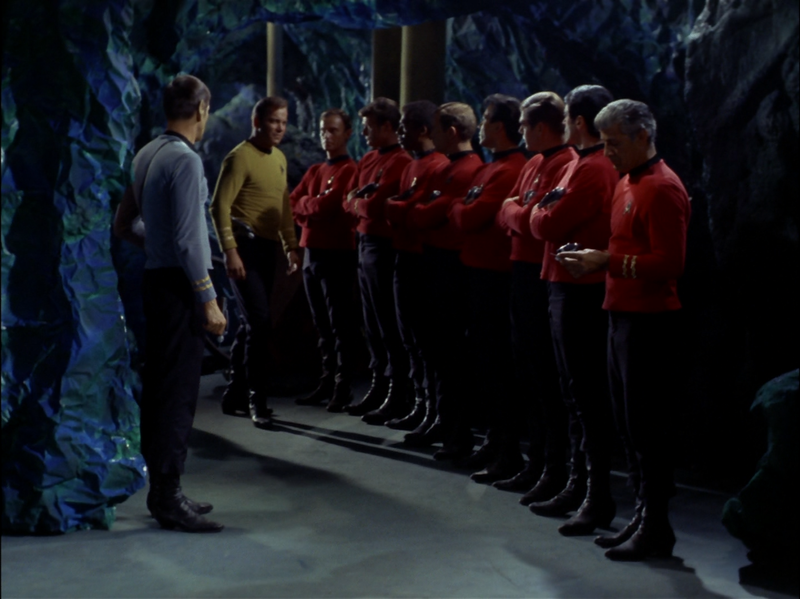 Spock by this point was quite taken with Kirk's prior pragmatic attitude and advised killing it on sight. 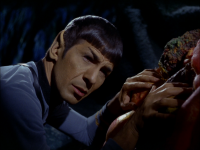 The way both men wrestle with their duty to save the miners and their scientific curiosity about the lasagna monster was nicely done and the use of a Vulcan mind meld as a means to fully understand the creature was a nice bit of continuity. I just wish those mind meld scenes weren't so frequently poorly acted and painfully slow. 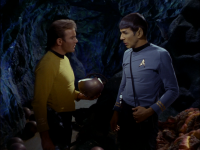 After the mind meld Spock learns a whole slew of fascinating things about the creature which is apparently an intelligent animal, possesses language, and calls itself a horta. 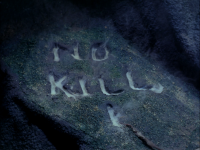 While it was fairly obvious from some of the first scenes that the silicon nodules were in fact eggs, thankfully the plot did not hinge its entire dramatic appeal solely on this revelation. Instead the focus on forging a peace treaty predicated on trade and mutual cooperation between the miners and the lasagna monsters was an excellent idea, true to the spirit of Star Trek. Much like in The Corbomite Maneuver or The Menagerie, the alien of the week has turned out not to be an evil monster after all but instead a sensitive intelligent creature which likewise desires peace and cooperation. 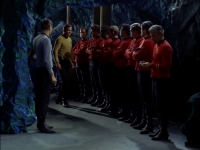 The idea that all life shares at some level a desire to avoid conflict is perhaps Star Trek's most inspiring theme and this episode is the best one so far to directly tackle it. You have something against English Imperial Units, I take it? And are you sure they are not U.S. Customary Units instead? If you look at the Apollo plans, components are measured in U.S. Customary Units. 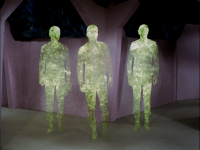 Why would Roddenberry use Metric? Seriously, the only people who ever seem to care about Metric are people who feel the need to feel scientific. Meanwhile, they can't seem to use a unit that can be divided by 3. Just think of that... You can't have a third of something, nor measure out 7/16 of an inch easily. How lame is that. I don't really mind it when they use the Imperial system, however it does make sense that they would use the metric system. After all, the Enterprise is an Earth built ship with a mostly Earth crew and the metric system is the most widespread measurement system on Earth (that was also true back in the '60s). In fact today there are only three countries in the world that don't use it as a primary system: The US, Myanmar and Liberia. Even the Brits who invented the Imperial system now use metric as the primary measurement system. The comparison with Apollo is forced to say the least. The Enterprise isn't an all-American project like Apollo was. And yeah, on a starship you'd expect that they use the best scientific measurement system around and, for the moment at least, that's metric. It's based on decimal multiples, just like our numbering system, you don't have to mess with various conversion factors when converting from one unit to another (you just have to move the decimal point or change an exponent), nor is there a need to express measurements in fractions. I loved how this episode looked like a standard fight the dangerous monster episode and turned out to be completely different. I never saw the ending coming until the eggs were found. I really liked this one. Aside from the almost comical appearance of the Horta, there was a lot of thought in this tale. Most of my gripes are related to McCoy's healing of the Horta. From Kirk's oddly agressive insistence that McCoy shutup and do something that he's not trained to do, to the eye-roll inducing line, "I'm a doctor, not a bricklayer! ", I had to cringe. Aside from these a few other very minor oddities, this was a great little story of rethinking initial impressions. There is, of course, the core Star Trek element of not only seeking out new life, but attempting to forge peaceful bonds with it, whenever possible. This episode took advantage of the opportunity to capitalize on this grand notion, whereas some previous episodes (such as "Arena") missed out. Episode is better than one would think given a synopsis (one without spoilers, anyway) of it. I thought the mind-meld scenes went on for too long. 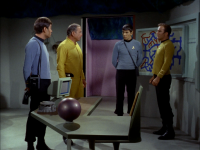 Notice that Kirk said, "The chart says these tunnels converge a few thousand yards further." A few thousand yards?! That's a few kilometers (to put it in metric units)! 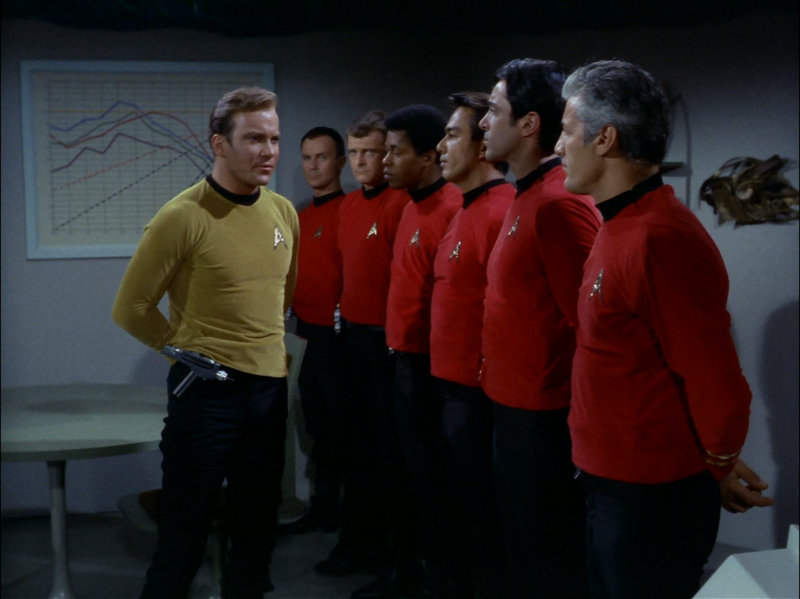 KIRK: You take the left (points to his right); I'll take the right (points to his left). Do they really think we're that stupid? Notice the cave floor is just a regular floor. Not a biggie. Just sayin'. 23rd level? There are at least 23 levels? That's a lot of levels! "We'll use clubs." Seriously? 30:31-30:36, 44:08-44:15, 44:25-44:28. I guess so! At 44:08 the miners club the red-shirts. Shouldn't they be charged with a crime? I love this episode and was actually more fascinated by the reviewers! Kethinov - I'm often amazed at your command of the language and truly appreciate the insights you bring to your reviews and thought about these stories! THANK YOU! As far as unit usage goes, this show was made for American audiences first and foremost, not Europeans. As far as the U.S. usage of metric vs. Imp. measurements go, the military has used metric as far as I can remember, which is a long-assed time! Feldmen - You seem to be nit-picking a bit. I like McCoy's, "I'm a doctor, not a..."! Check that, I love them! I thought of a true complaint that has not been addressed by anyone including myself which irritates me and prompts yet another comment! This Horta, "which moves through rock like we move through air" is not accurate at all! The creature moves through rock the way birds move through air, except that birds don't leave the equivalent of vacuums in their wake! These things, er, creatures should have left massive caverns or at least molten rubble in their wake, which would be far more accurate! The rock isn't simply being vaporized. Even if it could, there would be something left, heat, of extraordinary levels that no human could be close to it even months after the creature had gone! I know no one reads my nonsense this late in the game but I still feel the need to rant a little.